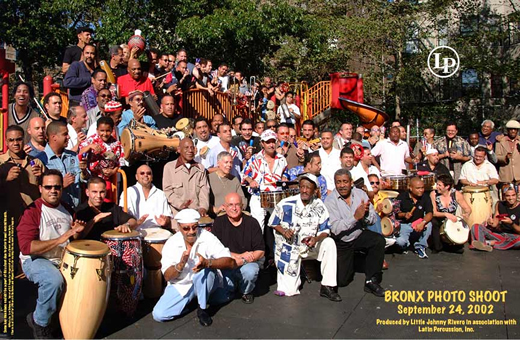 Close to one hundred of LP‘s top East Coast endorsers gathered at 52 People for Progress Park, in the Bronx, New York, on September 24, 2002 to help capture the spirit of Latin Music on film. The shoot, which was intended to be a quiet event, erupted into a spontaneous rumba jam that could be heard for blocks. The participants included Candido Camero, Carlos "Patato" Valdez, José Mangual, Jr., Milton Cardona, Pucho Brown, Mike Collazo Sr., Jose Madera, Eddie Montalvo, Orlando Marin, Jimmy Delgado, Bobby Sanabria, Pedro Martinez, Chino Nuñez, Chembo Corniel, Steve Kroon, Robby Ameen, Memo Acevedo, Robyn Lobe, Ralph Irizarry, Bashiri Johnson, Daniel Reyes, Erik Velez, Jose Jusino, Chris Theberge, Dafnis Prieto, Little Johnny Rivero, Daniel Sadownick, Ray Diaz, Frankie Vazquez, Mike Collazo Jr., Tyrome Govan, Nicky Marrero, Jimmy Sabater, Ernie Ensley, George Delgado, Harry Adorno, Orlando Vega, Dave Valentin, Alfredo De La Fé, Victor Hernandez, Vinnie Montalvo, Noey Matos, Luis Campana, Tony Rosa, Ricky Salas, John Benitez, Gilbert Colon, Jorge Gonzalez, Nicky Laboy, Pucho Matos, Maximo Rodriguez, Camilo Gaetán, Tony Fuentes, Gilmore Gomes, Tony Escapa, José Grajales, Ricky Gonzalez, Willie Romero, Tony Cintron, Walter Reyes, Mayra Casales, Vince Cherico, Joesph Rodriguez, Israel Tannenbaum, Ivan Renta, Renato Thoms, Johnny Griggs, Jesse Perez, Raul Agraz, Willie Torres, Luis Bonilla, Willie Villegas, and others. Check out photos of this historic event. 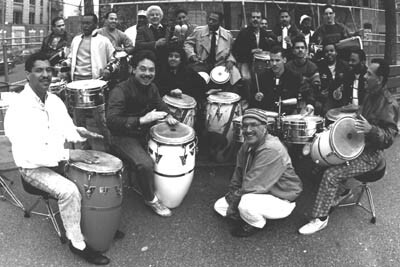 The park was the same location where the late Tito Puente and other great percussionist gathered to celebrate Tito's 65th birthday some 15 years earlier.